A trio of hardbacks: The Palace is DG Compton’s one and only (as far as I’m aware) mainstream novel, and very hard to find. I don’t think it even made it into paperback. I found this copy on abebooks.co.uk, it was not cheap. 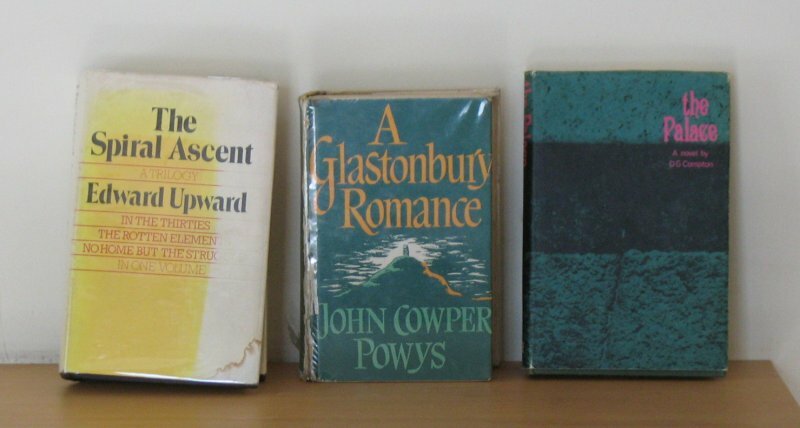 A Glastonbury Romance was a charity shop find; it’s ex-library and a bit tatty, but never mind. The Spiral Ascent is… Well, you see, it goes like this: I had a copy of the first book of the trilogy, In the Thirties, in its original Penguin paperback edition. I wanted books 2 and 3 to match… but I couldn’t find them. So I decided to get the omnibus edition instead – and I found this signed edition on abebooks.co.uk. The cover is a faded but still. Signed. Incidentally, you can download the entire trilogy in PDF format from here, but still… books. You can also get some lovely small press books by Upward from Enitharmon Press here. Last year, I bought a copy of The Quiet War on eBay because the seller said it was the hardback edition. It wasn’t, it was a trade paperback. I complained and received a partial refund. Earlier this year, I read the book… and I had problems with it. And then this month, I found this hardback copy of it in a local charity shop. So of course I bought it. Bargain. We See A Different Frontier is a collection of postcolonial genre stories. Swords of Good Men I have to review for Interzone. Fantasy, meh; but… Vikings. Set it in Space and Shovel Coal into it is the second anthology by the Sheffield Science Fiction and Fantasy Writers Group, and the introduction is by Yours Truly. 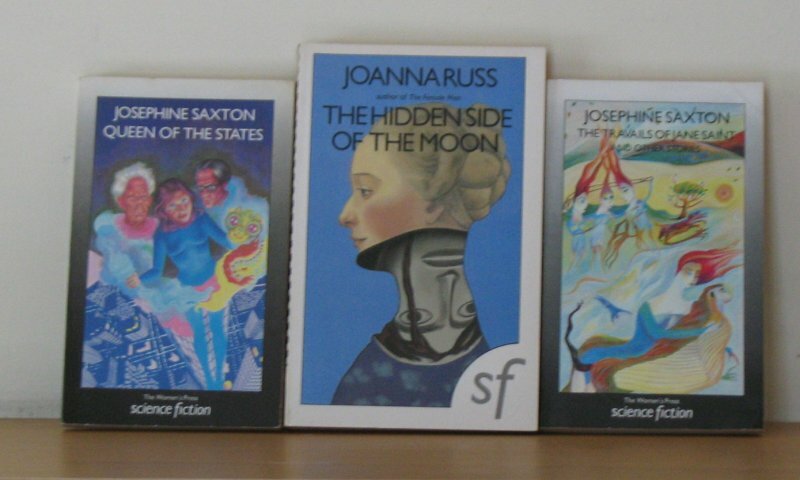 Three Women’s Press sf books for the collection – I now have two dozen of them – sent to me by The Space Merchants in exchange for a copy of Night and the Enemy, a graphic novel by Harlan Ellison and Ken Steacy I no longer wanted. Expect to see these three books reviewed on SF Mistressworks at some point. Three paperbacks by two dead white males. I’ve read the first book of Snow’s Strangers and Brothers and I plan to read the entire series. The Conscience of the Rich and The Light and the Dark are books three and four respectively (by internal chronology, not year of publication). 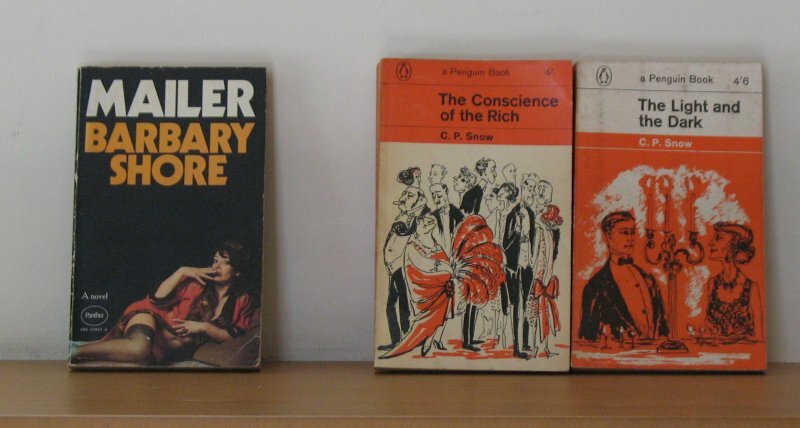 Of course, I will only buy matching editions – the 1960s Penguin paperback editions. A local charity shop had a bunch of 1970s Norman Mailer paperbacks in – just look at that cover – and I picked out Barbary Shore. I may go back and buy the others, if they’re still there. Three charity shop finds. Eleanor Catton’s The Luminaries has been longlisted for the Booker and looks very interesting, so I was quite chuffed to stumble on a copy of her first novel, The Rehearsal… which David Hebblethwaite tells me is the best book he’s read in the past five years. You don’t expect to find Naguib Mahfouz novels published by the American University in Cairo Press in Yorkshire charity shops, but I found one. 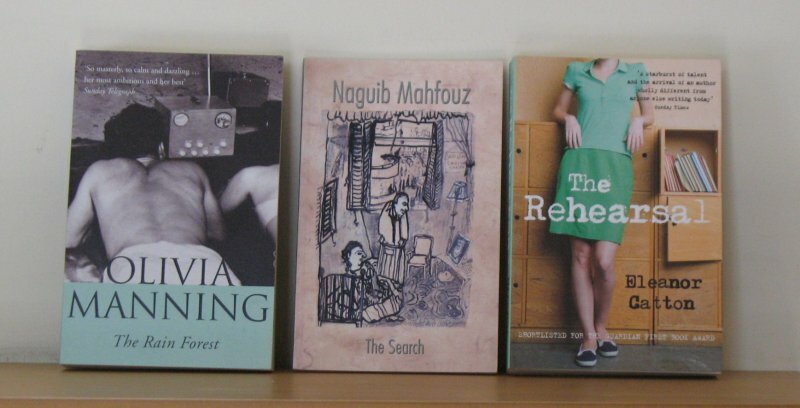 I read Mahfouz whenever I stumble across copies of his books. I still have his Cairo trilogy – in Arabic, of course – to read… Olivia Manning’s The Balkan Trilogy and The Levant Trilogy – also adapted for television as Fortunes Of War – are brilliant, so she’s a name I certainly look out for during my frequent trawls through books in the local charity shops. The Rain Forest was her last novel. Categories: book haul, books | Tags: cp snow, dg compton, djibril al-ayad, edward upward, eleanor catton, fabio fernandes, joanna russ, john cowper powys, josephine saxton, naguib mahfouz, norman mailer, olivia manning, paul mcauley, snorri kristjansson, SSFFWG | Permalink.